What does it take to tempt the customers to visit the physical shops and is it possible at all in the modern, technological world we are living in? This was one of the topics at the conference ‘NRF Retail’s BIG Show’ which was held in New York in January. And the answer is that of course it is possible. All it takes is that the physical shops are rethinking themselves today and offer something unique and different allowing the shops and the webshop to supplement each other to a greater extent. The physical shops as we know them are history. This was one of the messages at this year’s ‘NRF Retail’s BIG Show’ – the world's largest retail conference. Today, we talk about the concept “we do not go shopping – we ARE shopping” where the consumers today, on all media where they are, constantly have the opportunity to be in a shopping situation. In this connection, they naturally use e-commerce on a large scale since they always have these shops close at hand and can shop when and where they want. 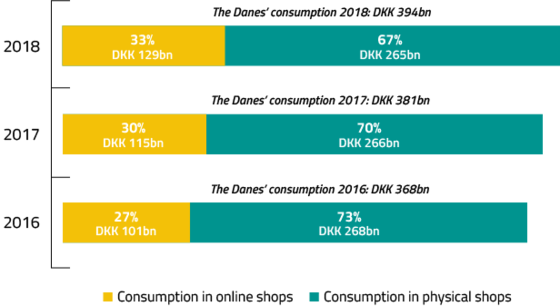 In Denmark, the industry has not missed the tendency and the latest figures from FDIH show modestly but still very clearly that there has been a change in the Danes’ shopping habits during the past three years. Perhaps it comes as no surprise that we experience an increase in online shopping and at the same time see a shopping reduction in the physical shops – to a great extent if the selection is the same in the physical shops as online. Numbers drawned from FDIH's yearly report 2018. Although the tendency clearly shows that e-commerce has started to take over a larger share of the shopping from the physical shops, this does certainly not mean that we no longer need the physical shops. However, it is even more important that you retailers focus on how the customers move across platforms and how you, in a unique and different way, can integrate and use your physical shops as an active part of the customer journey and offer them an experience which they cannot get from the webshop. You can therefore benefit from rethinking and designing your physical shops so you offer the customers precisely what make them want to tie their shoes, put on their coats and stroll along the pedestrian street or the shopping centre to visit your shop. In the iconic and enchanting 1,800 square metre toy store FAO Schwarz in Manhattan in New York they have acted on the trend and are offering the customers unique experiences which make them visit the store on a large scale. 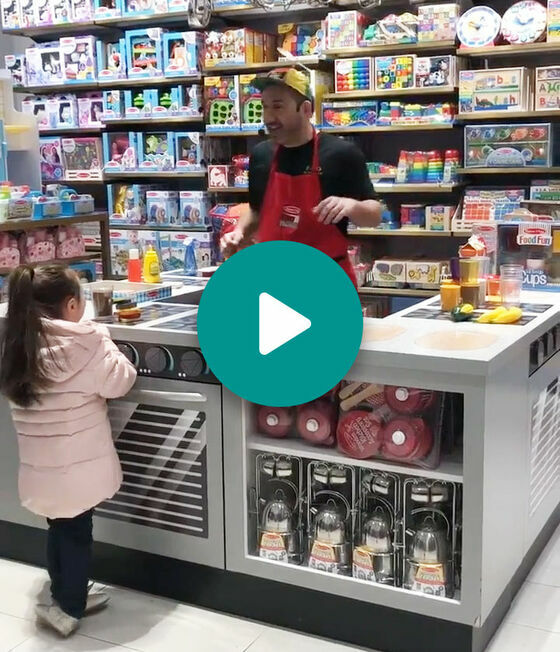 Here the toy comes to life when the committed staff passionately throw boomerangs, play TV kitchen with toy food and give the children the opportunity to fill their own trolleys, wheel them around the miniature supermarket and check out their products at the cash registers. 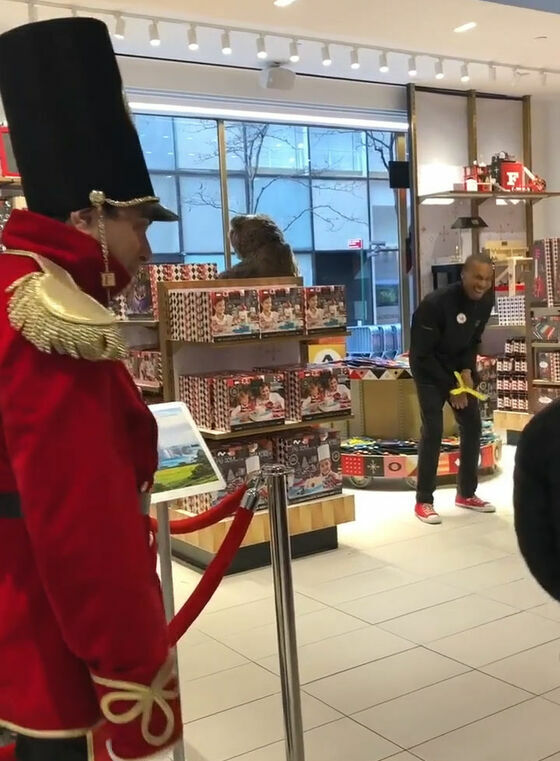 In FAO Schwarz the main focus is not sale of toys which have been lined up on shelves as straight as an arrow with a feeling of “to see – not touch”. They have realised that if this is what people want, they will probably just order the goods in the webshop. As a result, the formula for the ideal toy store according to David Conn, CEO at ThreeSixty Group which owns FAO Schwarz, is very simple: ”make the space experiential and one that can deliver theater”. By bringing magic and fantasy into the stores and creating a space that is more like a play centre than a store, children as well as adults will be rushing to their magic toy store and play in their world of fairy tales. The Californian organic label Reformation has also focused on the experience when the customers visit the store in New York. Contrary to the toy store’s curious and adventurous atmosphere that touches the hearts of all children, this store focuses on simplicity, tranquillity and aesthetics. To obtain this vision, the store has been designed in bright colours with a minimalistic style and with just one size of every style. From a distance it is not impressive but beneath the surface or more likely behind the doors of the wardrobe hides a world of magic and fashion wear. Via screens on the walls of the store or assisted by the staff and their mobile POS, the customers can select precisely the clothes they wish to try on and add it directly to the fitting room without having to go through racks of clothes to find the right size or carry piles of clothes around the store. In Reformation, the magic starts when the customers – without the selected clothes in their arms – step into the fitting room, open the wardrobe to find that everything they have selected hangs neatly in the correct sizes. A pleasant and effortless shopping experience where the customer can focus on trying on the clothes comfortably as if they were at home. If the clothes do not fit or if the customers want a different size, they can find something new by a few pushes on the screens in the fitting room and after a few minutes, it hangs in the magic wardrobe. Are you also interested in offering your customers an adventurous experience they wish to walk down the street to get, we would like to invite you for a cup of coffee or visit you for a non-binding talk about your options. The consumers' interaction with brands is today spread over a multitude of different platforms. The customer experience you create across your channels is consequently of great importance for the customers' association with your brand. But how do you create involving customer experiences which increase your brand loyalty.